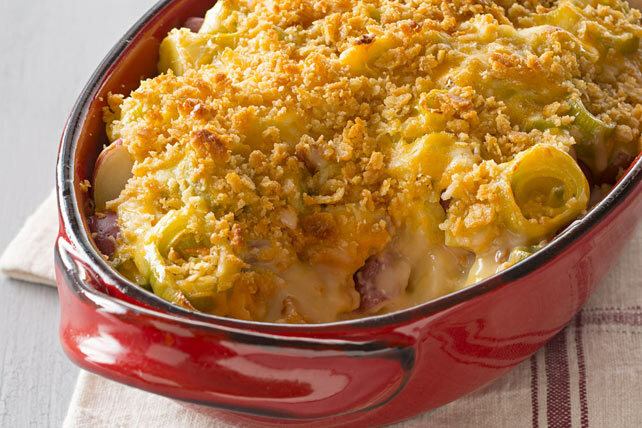 Here's a delicious choice for a potato side dish: a mouthwatering casserole filled with cheesy potatoes and leeks, then finished off with a buttery cracker topping. Cook potatoes in boiling water in saucepan 10 min. Meanwhile, cook and stir leeks in large nonstick skillet on medium heat 6 to 8 min. or until tender. Stir in 1-1/4 cups broth. Whisk flour and remaining broth in small bowl until blended. Gradually stir into ingredients in skillet; cook 5 min. or until thickened, stirring constantly. Add Kraft Singles pieces and 1/2 cup shredded cheese; cook and stir 4 min. or until melted. Heat oven to 400ºF. Drain potatoes; place in 2.5-L casserole dish sprayed with cooking spray. Cover with cheese sauce; top with remaining shredded cheese, then combined cracker crumbs and butter. Bake 20 min. or until potatoes are tender and sauce is heated through. Prepare using Cracker Barrel Shredded Old Cheddar Cheese. Any variety of potato can be used to prepare this recipe. If using small potatoes, quarter them instead of cutting them into 3/4-inch cubes. To cook the potatoes in the microwave, place cubed potatoes in large microwaveable bowl. Add 1/2 cup water. Microwave on HIGH 15 min. or just until potatoes are tender. Drain, then use as directed.